This week we re-visit Phoebe Phillips of Sunday Weaves in a special collaboration with Stackwood. 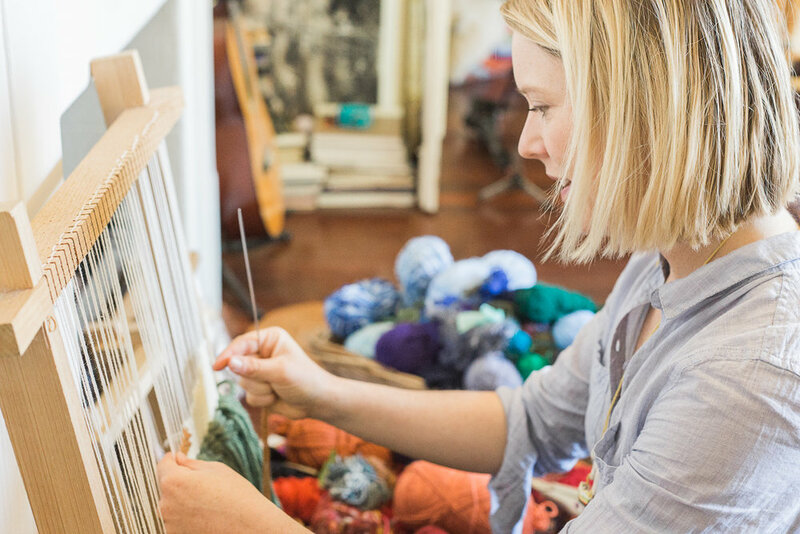 Phoebe is a textile artist and Fremantle native who shares her love for craft, natural fibres and the loom through her regular workshops. Learning her craft from her mother, Sunday Weaves is a way for Phoebe to share her skills with the community and is also her idea of a perfect Sunday; space where you can slow down, drink good coffee, have a great conversation and immerse yourself in a creative project. Phoebe is a textile artist and Fremantle native who shares her love for craft, natural fibres and the loom through her regular workshops. Sunday Weaves, how did it all start? I’ve always had different creative projects on the go, but it was my good friend and fellow weaver Amy Ilic from England who gave me the initial nudge to make more time for my work on the loom and to teach workshops. I was brought up in a very Fremantle sitting with my mother teaching women's arts workshops from her tepee. So textiles and women’s groups have always been a big part of my upbringing. I didn't realise this was anything out of the ordinary until I hit high school and realised growing up in a commune with your mum running a business out of her tepee was slightly unusual. The workshops have also been a really important part of my practice, as I love being out of my studio and discussing creative projects and ideas with other people. I also find it inspiring to see how people can go from not having woven before to creating something really unique and original. I often find a person's best weave is created on the first go when they are just experimenting and playing with no constraints or expectations. It's awesome seeing what people come up with. "I was brought up in a very Fremantle sitting with my mother teaching women's arts workshops from her tepee. So textiles and women’s groups have always been a big part of my upbringing." Weaving is a very addictive and calming practice. I am drawn to the slow methodical nature of this craft practice. I like how working on a hand loom cannot be sped up or mass produced, it’s a meditative process that forces you to slow down, take time and gradually build a piece. I am really inspired by crafts as a cultural practice and how social barriers are broken down between strangers once they get there hands busy in a creative project. It's pretty incredible watching how a group of total strangers can create this intimate environment sharing quite personal information after only a few hours of working on a textiles project together. Additionally, I’m fascinated with the long-standing history of weaving in Indigenous cultures and how it has been interpreted and reinterpreted across different continents and time periods. 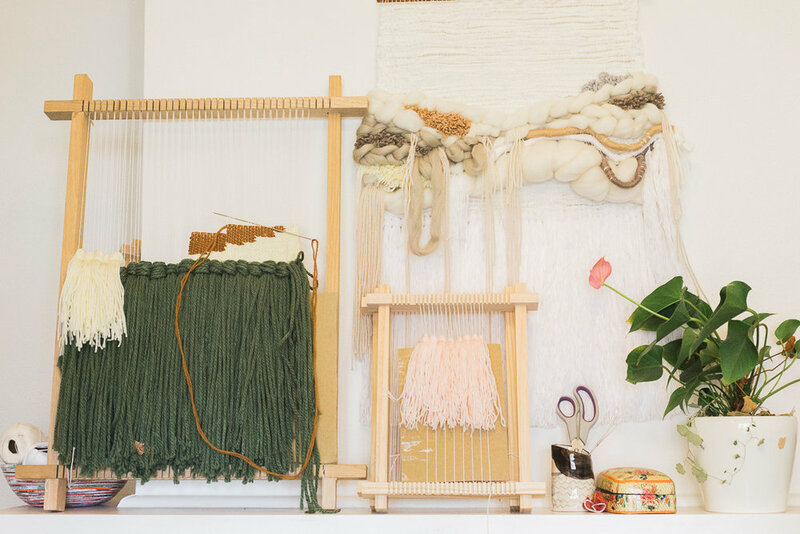 I’m really curious about the new wave of interest in weaving today and this ‘DIY’ trend, where people are using weaving and crafts as a form of health and well being. How do you go about making a piece - what's the process from start to finish? I’m a big journal-er. I love making to-do lists, sketches, picking out fabric swatches, or magazine clippings. Although weaving is very textural, I find a lot of my inspiration comes from architecture and photography, which is strange considering both those mediums are 2D whilst weaving is most commonly 3D. What is linked is the process of making a weave is always from the bottom upwards, kind of like building a house (not that I know how to do that). How long does it take to finish each piece? I get asked about the time it takes to make a weaving a lot and it is very varied. There are a lot of factors involved, it depends on which loom I’m using and what fibres I’ve found or sourced and how much coffee I have consumed on each given day. "I am really inspired by crafts as a cultural practice and how social barriers are broken down between strangers once they get there hands busy in a creative project." "I love making to-do lists, sketches, picking out fabric swatches, or magazine clippings. Although weaving is very textural, I find a lot of my inspiration comes from architecture and photography..."
"I am drawn to the slow methodical nature of this craft practice. I like how working on a hand loom cannot be sped up or mass produced, it’s a meditative process that forces you to slow down, take time and gradually build a piece. Mostly, I use recycled and Australian wool, rope wood copper and recycled materials in my workshops. Although wool is the easiest fibre to use to teach people I’m moving more and more towards recycled fabric. There is just so much fabric thrown out all the time it is such a great source. I’ve been questioning my own consumption of processed materials lately, especially all the fibres I use in my wall hangings and and workshops. I think a lot of makers and artists struggle with this. Recently I was about to throw out an old ripped bed sheet that was looking seriously haggard, and instead I used that as a starting point for a small collection of weaves. Because they take such a long time to produce I usually explore an idea in a small series of 4-5 weaves, so it’s all very limited quantities in the production and design. Although I am completely biased, I think almost anything looks amazing between the warp. One of my favourite weaves I’ve seen was by a chef who had woven chives into a wall hanging purely for a form of convenient storage in his kitchen. But, it looked amazing. As they wilted it looked more and more interesting. "Although wool is the easiest fibre to use to teach people I’m moving more and more towards recycled fabric. There is just so much fabric thrown out all the time it is such a great source." "I love being able to work on something that challenges and inspires me." What is your favourite part about doing what you do? I love being able to work on something that challenges and inspires me. I’m naturally quite a speedy person so having access to such a calming medium is both wonderful and challenging and I really appreciate that. I’m also continuously grateful for the women (and the occasional men) who have come to my workshops and support what I do. It is very powerful being around that many people being focused and creative. Good question. I think I’m naturally a very social and active person so I can often struggle with finishing bigger projects and doing long stints on my own. I also, can get quite obsessed with a project and need to remember there are other things in life other than my loom such as partners and family who need my support. So I think finding balance is also a tricky aspect for any creative individual. What should you expect when you come to a Sunday Weaves workshop? Think great wool, beautiful wooden handlooms, and great people, in a stunning location showered with delicious tea and coffee and cakes. Basically, I recreate my perfect ‘Sunday’ and serve it up for everyone; it’s a lot of fun. Everyone who comes walks away with their own wooden handloom that I make in a studio in Fremantle as well as an instruction booklet and a full belly. I’m also, always amazed at how great everyone is who comes to the workshops. I don’t want to jinx myself here, but I have taught quite a few of these classes and it only seems to attract the most awesome people, it is such a pleasure to host these workshops. If you would like to find out more about Phoebe's workshops visit www.sundayweaves.com or Stackwood.